That “selfish, arrogant little punk” DeSean Jackson, who was named one of the “10 biggest jerks in the NFL” is at it again! A young man who has already donated his time and money to fighting bullying, fighting the cancer that claimed his father and helping make a wish children is now supporting our veterans. Jackson will be at Ft. Dix & McGuire Air Force base today at 1pm to meet wounded US veterans and present a donation of $50,000 to the Wounded Warrior project. I get that DeSean Jackson likes to dance after he catches touchdowns and some people don’t like that. But the truest reflection of this kid’s character is in stuff like this. 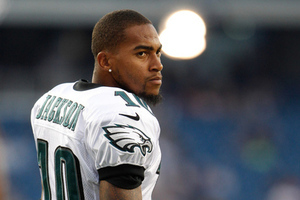 I’m proud to have a guy like DeSean Jackson to root for. He isn’t a “jerk” as Mike Freeman of CBS thinks. He’s a role model and if the rest of the NFL followed his lead, we’d all be better off. So next time your catch a TD, dance all you like DeSean. You’ve earned it.